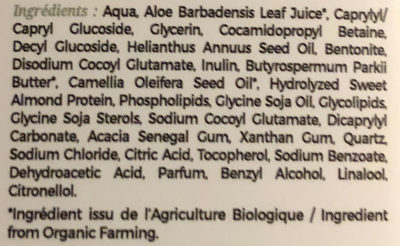 Aqua, Aloe Barbadensis Leaf Juice*, Capryly/Capryl Glucoside, Glycerin, Cocamidopropyl Betaine, Decyl Glucoside, Helianthus Annuus Seed Oil, Bentonite, Disodium Cocoyl Glutamate, Inulin, Butyrospermum Parkii Butter*, Camellia Oleifera Seed Oil*, Hydrolyzed Sweet Almond Protein, Phospholipids, Glycine Soja Oil, Glycolipids Glycine Soja Sterols, Sodium Cocoyl Glutamate, Dicaprylyl Carbonate, Acacia Senegal Gum, Xanthan Gum, Quartz Sodium Chloride, Citric Acid, Tocopherol, Sodium Benzoate, Dehydroacetic Acid, Parfum, Benzyl Alcohol, Linalool. Citronellol. * Ingredient from Organic Farming. Product added on March 11, 2019 at 8:45:26 PM CET by openfoodfacts-contributors. Last edit of product page on March 15, 2019 at 7:14:59 PM CET by khorkaadren. Product page also edited by roboto-app, sebleouf.